Twelve months ago, Firefox was just a noselength behind Internet Explorer as the most used browser to visit http://www.regular-expressions.info/. Now, Firefox has a comfortable lead. For the full month of 2006, 56.8% of all page views were served to Firefox users, vs. 40.8% for Internet Explorer. This time I also tallied the stats for the JGsoft.com order form. I only counted POST requests, indicating actual order attempts rather than window shoppers. MSIE accounted for exactly 60.0% of the hits, while Firefox had 39.2%. In October 2005 those numbers were 67.6% and 31.3% respectively. It’ll be interesting to see if MSIE 7 can reverse the trend by October 2007. 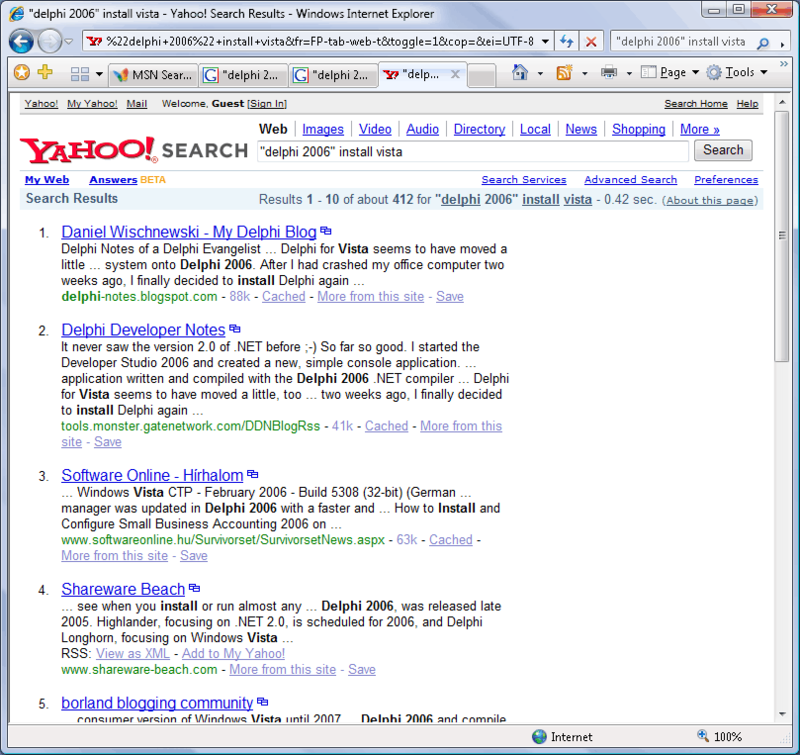 Search results returned by the major search engines often leave me frustrated. I’ve wanted to blog about this topic for some time. Today, I stumbled upon a surprising example. This morning I was messing around with the February CTP of Windows Vista. I tried installing Delphi 2006, but it didn’t get past installing its many prerequisites. 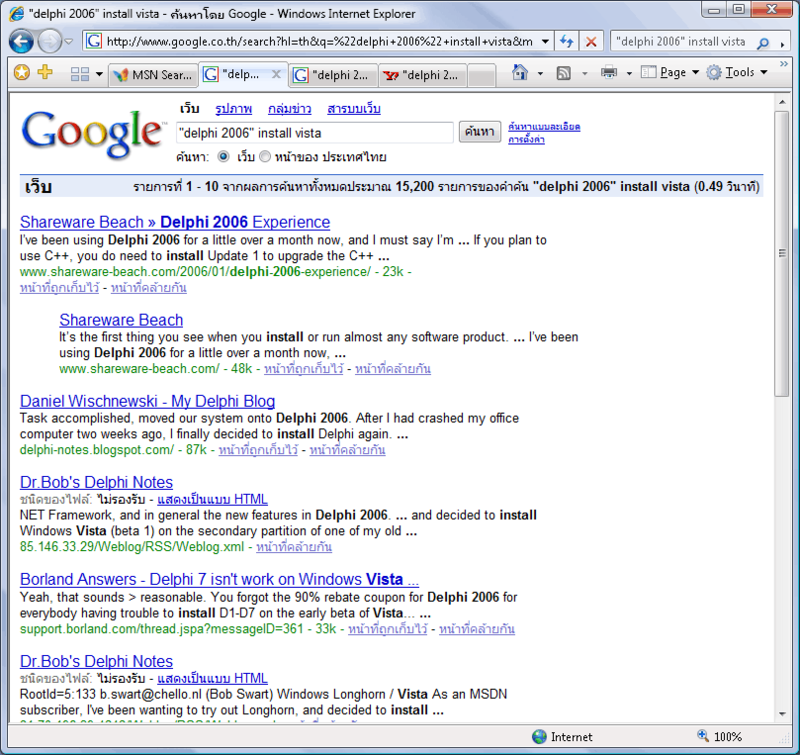 So I fired up IE and typed “delphi 2006″ install vista in the search box. 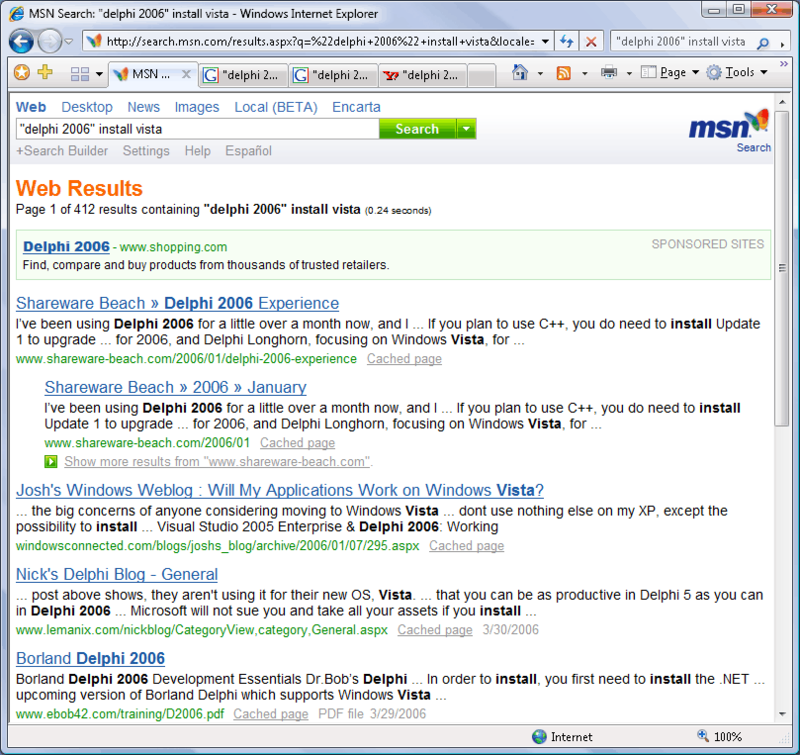 The first page of MSN’s search results didn’t list any pages talking about installing Delphi 2006 on Vista. However, the #1 search result had me quite surprised. So I repeated the search on Google Thailand, Google.com and Yahoo. The results were quite consistent. The #1, #1, #2 and #4 hits in these four searches, respectively, pointed to my very own blog! The search engines were telling me I am the most likely source for an answer to my own question. 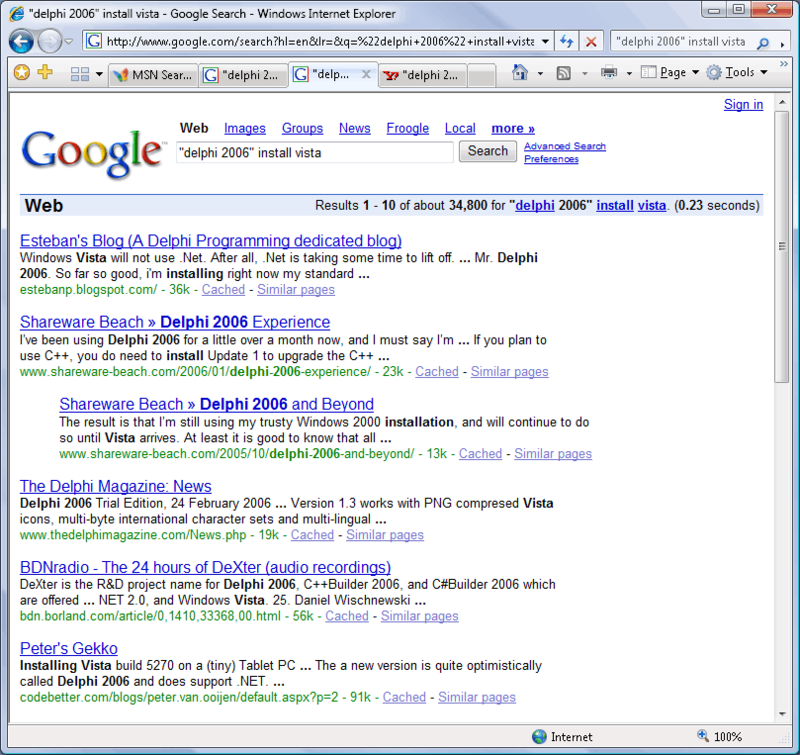 The search engines picked up an article about my experiences with Delphi 2006 I wrote in January. I obviously mentioned Delphi 2006. I also talked about installing something, namely Update 1. I also mentioned Windows Vista in my summary of Borland’s road map for Delphi. But I didn’t say anything about installing Delphi 2006 on Vista. All of the other top 10 search results were like that. They all mentioned the 3 concepts I was searching for (“Delphi 2006″, “install”, and “Vista”), but none said anything about those 3 concepts related to each other (“How do I install Delphi 2006 on Vista”). The major search engines are very good at finding pages relative to a single concept, but they often fail at producing useful results when I want to find multiple concepts related to each other. The worst situation is when it picks up one concept in the main text of the page, and another in a link in a navigation sidebar (e.g. a page talking about installing Visual Studio on Vista, and a link to the site’s Delphi section in the sidebar). It’s probably difficult for a search engine to figure out that my blog post doesn’t talk about what I was searching for. But excluding navigation sidebars should be relatively easy. If anyone is trying to compete with MSN, Google, or Yahoo, solving this problem is what would make me switch to your search engine in an instance. Perhaps there simply aren’t any pages explaining how to install Delphi 2006 on Vista. If so, just tell me, so I can quit looking. Which I ended up doing anyway. If Delphi 2007 runs on Vista that’ll be fine with me. Seems like it might be out before Vista after all, if Borland or the new company keeps the new tradition of releasing next year’s Delphi in the 4th quarter. At least I got to enjoy my blog being #1 for a search term that people might actually search for. By the time you read this, my new post will probably have taken over the #1 spot. It would be a valid search result, since I did talk about installing Delphi 2006 on Vista, but you won’t learn anything about how to do so. I was just going over the logs for my web site http://www.regular-expressions.info/. In the browser statistics, Firefox and Internet Explorer were tied at 48.5%. Firefox was just a few hundred page hits shy of overtaking Internet Explorer as the most used browser to access this web site. Firefox usage for my product web sites varies from 10% to 45%, with higher traffic sites getting relatively more Firefox traffic. If my recent posts about online music services thought I was an old hand at buying music downloads, that’s unfortunately not the case. I say “unfortunately”, because most services simply don’t want to take my money. “U.S. residents only” they say. So much for the global reach of the Internet. It makes no sense. Amazon.com has never refused to sell me a CD. I’ve ordered over a dozen from them over the years, mostly music that isn’t mainstream and impossible to find in stores. If Amazon can export U.S. music, then so can download services if they really want to. Adding local music from around the world to their catalogs would obviously take more time and effort. MP3tunes.com imposes no territorial restrictions. Their catalog seems to consist entirely of music by little-known artists. I guess that since they don’t have deals with the major record labels, MP3tunes has much more freedom in setting their own policies. They sell songs for 88 cents and albums for $8.8 US. The songs are high-bitrate MP3 files without any kind of copy protection. You can even re-download all the songs you’ve purchased at any time, in case you didn’t make a backup. So far so good. Before you enter your credit card details on their site, one word of warning: once you’ve logged in, all “buy now” buttons do exactly that: with one click, you’ve bought the song or CD and your card is charged. That wouldn’t be so bad (in fact, it would be really convenient) if it was possible to cancel the purchase. Buying a CD does not automatically start the download. So until you’ve downloaded the music for the first time, the download page could easily show a refund button. Downloading is also a bit more cumbersome than it should be, at least if you’re not using a download manager. Unlike the one-click buy, there’s no one-click download. I’d rather download the whole album as one .zip file. But none of that will stop MP3tunes from becoming a success. The real problem is that it’s simply too cumbersome to discover new music on MP3tunes.com. With a catalog of unknown artists, easy discovery is a vital feature. What I’ve found most annoying is that the 30-second samples have to be downloaded. They don’t stream in once you click on them, like the samples on Amazon.com. Sampling a CD takes time. Click on a song, wait for the download, listen to the sample, repeat. A 5-minute streaming CD sampler (i.e. an MP3 of 30-second samples stiched together) would be far more convenient. The music is also poorly categorized. When you click on an album in one category, the breadcrumbs at the top of the album page often indicate a completely different category. It seems many albums are placed in multiple categories. A cheap trick to make a catalog look larger. Unfortunately, it quickly backfires. If I expect to hear a reggea beat but my laptop’s speakers blast rock music, I’m not impressed. Not to mention if I’m going to wait for another 30-second sample download. The company claims they “spotlight emerging artists”. If they really want to promote artists, Internet radio would be a far better medium than 30-second samples. Radio plays in the background while I work. Listening to samples is an activity that doesn’t mix well with tasks that require concentration. So it’s unlikely MP3tunes’ artists are going to get much of my listening time.